Hello Everyone! 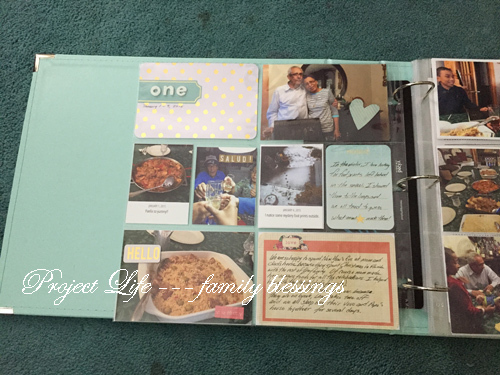 For the past two years I have been wanting to include my journey with Project Life on my blog but lack of time and the fact that I managed to get seriously behind made me refrain. 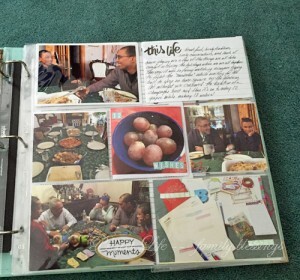 Last year, was my best year with it – I have only 4 months to complete last year’s album. I have a pretty good system and a weekly craft hour with my girlfriend Ashley that helps keep me honest. I stopped traditional scrapbooking a while back and really wanted a way to capture our family memories and Project Life really seemed like a logical fit. This year I made even more changes to my system. One thing I am doing is limiting my options by using mostly two core kits. I think having too many choices can really slow me down. I use WeRMemory Keepers albums. I love the quality and color selection they have. I chose to only include New Years day (January 1) as the start of the first week because I wanted to keep all 2014 in it’s own album. But I realized that many people included all the days in Week one which included the end of December. Week one included pictures of our New Year’s celebrations. We stayed over my in-laws house and she and I made a yummy Paella as one plate for the celebrations. Another fun thing I included is a little mystery game I started with Apollo and Nicholas. When we are out going to school or coming home we look around for footprints in the snow and try to guess what animal made them. It’s a lot of fun and it helps them to slow down and take notice of nature even if for a moment. A fun tradition that I learned when marrying Leao is the 12 wishes you make once it is new years. 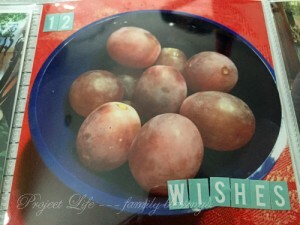 You make a wish and then eat each grape. It’s fun and the boys just love doing it. Another thing I’m doing now is using my handwriting for journaling. I used to type on the computer and although I would say I’m not a great fan of my handwriting, it’s faster to just right it out. I may from time to time if I need to fit more, type out a few but just being able to write it out is helping to streamline the process. One thing we do a lot of when we are together with family is play board games. 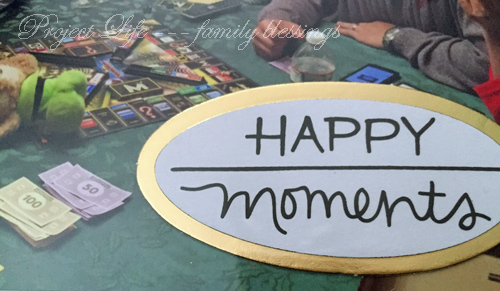 One of our favorite is Monopoly Empire. It’s so much fun and a lot faster than the traditional Monopoly game. My mother-in-law is an amazing cook. She cooks the most delicious Cape Verdian dishes and her presentation is always a class act. I always tell her if I were her child, I would have stayed in and eat her food all day instead of playing with friends. 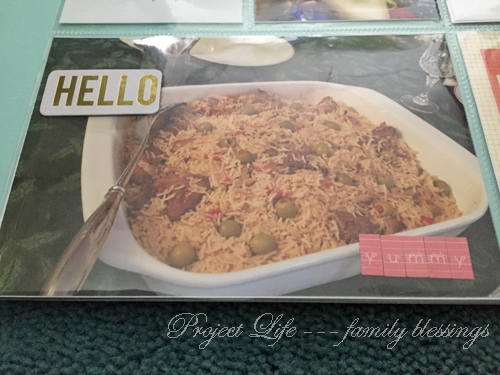 And this is my week one of my 2015 Project Life album. 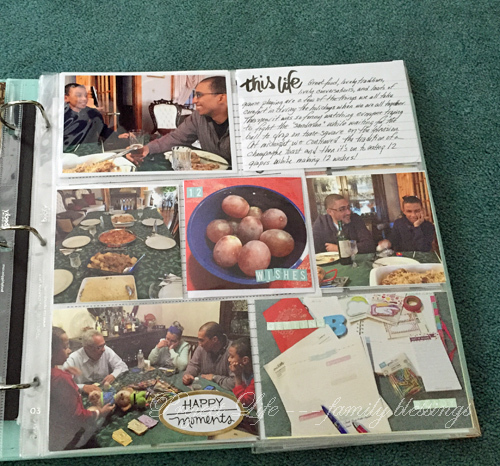 Each week, I will share my journey with my memory keeping. I waited until I had a few weeks complete so that I could ensure content would be available to post. Have a blessed day everyone! You are doing fantastic keeping up with your FL! It looks amazing! I love the 12 grapes thing!!! Thanks. Between Ashley and this blog,I have no choice but to keep up!